FeinCMS provides two ModelAdmin classes, ItemEditor, and TreeEditor. Their purpose and their customization hooks are briefly discussed here. The tree editor replaces the standard change list interface with a collapsible item tree. The model must be registered with django-mptt for this to work. All standard ModelAdmin attributes such as ModelAdmin.list_display, ModelAdmin.list_editable, ModelAdmin.list_filter work as normally. The only exception to this rule is the column showing the tree structure (the second column in the image). There, we always show the value of Model.__str__ currently. The tree editor allows you to define boolean columns which let the website administrator change the value of the boolean using a simple click on the icon. These boolean columns can be aware of the tree structure. For example, if an object’s active flag influences the state of its descendants, the tree editor interface is able to show not only the state of the modified element, but also the state of all its descendants without having to reload the page. Currently, documentation for this feature is not available yet. You can take a look at the implementation of the is_visible and in_navigation columns of the page editor however. The tabbed interface below is used to edit content and other properties of the edited object. A tab is shown for every region of the template or element, depending on whether templates are activated for the object in question . 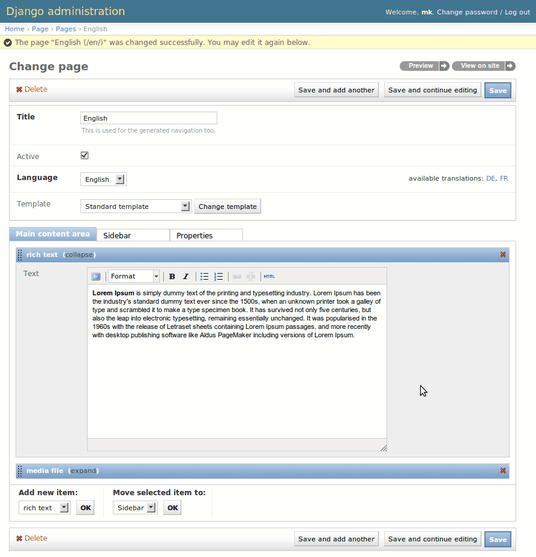 Templates are required for the page module; blog entries managed through the item editor probably won’t have a use for them. A list of callables using which you may add additional values to the item editor templates. You can specify the base class which should be used for the content type model. The default value is django.forms.ModelForm. If you want to customize the form, chances are it is a better idea to set feincms_item_editor_inline instead. Take a look at the richtext item editor include files to understand how this should be done. This can be used to override the InlineModelAdmin class used for the content type. The custom inline should inherit from FeinCMSInline or be configured the same way. If you override fieldsets or fields you must include region and ordering even though they aren’t shown in the administration interface. For a more complete (but also more verbose) implementation, have a look at the files inside feincms/module/page/.